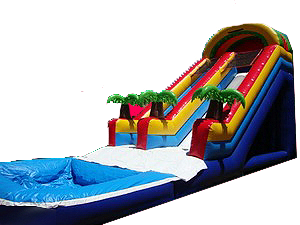 This 20ft Palm Tree Water Slide is great for a tropical theme event. Palm trees at each end, front load climbing wall to a 20 ft tall slide and then down you go into a huge splash pool.Recommend 3 kids at a time, one sliding, one climbing and one entering. This unit must be staked or tied off for safety, otherwise water barrels must be ordered.